I don't normally do this, but since so many have followed me into DUG, this is a heads-up that I flipped out of DUG today and have reversed long via XLE (or use DIG, the Long Oil equivalent of DUG). I closed out my DUG calls at $7.80, for a 130% gain. 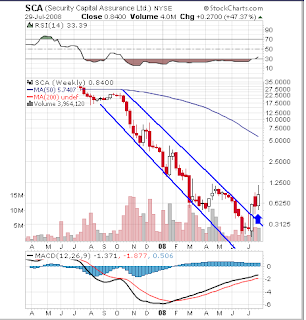 On the Daily DIG chart below, look at how deply oversold the MACD is, going back an entire year. This is reflected also in the down slope of the price decline, straight down for the past month. Some kind of bounce is overdue. 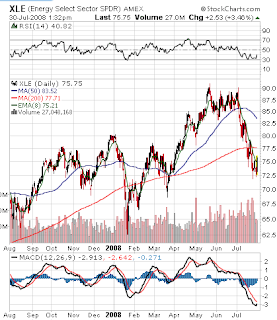 A full fledged reversal to new highs in the XLE has to start with a bounce, so although early based on the technicals, Oil is up $4.00 as of 2:00PM EDT Wednesday, so I am going for the bounce here, at a minimum. I'm buying SCA in the morning, because it was up 62% on Tuesday, after being down 99% in the past few years and with the hope it will be up 500% or more in the next few months. But first, what do I mean, "A pig in a poke?" As for SCA, it is in incredibly complex financial waters, but today it traded over 3.7M shares, average is 700K, and it was up 62%. This flurry of buying came on the heels of an agreement to settle claims against it by Merrill Lynch, pertaining to debt that SCA had insured but now Merrill Lynch was virtually giving away. To go any further into the complex web of financial cross currents and entanglements that SCA is caught up in would be beyond the scope of any semblance of my understanding, so suffice it to say, SCA is a proverbial pig in a poke. The Trade: SCA is followed by some pretty savvy traders that I know. They are suggesting that as of Tuesday's settlement with Merrill Lynch, SCA is worth somewhere north of $5.00/share. There are some who even talk of double digits for this stock. There may be some bona fide hype about to ignite these shares a lot higher in the days and weeks ahead. A lot will depend on factors that I do not understand, ergo the characterization of SCA as, A pig in a poke. A reader asked for an update on HYGS. It was highlighted on July 1st at $0.90 and ran up over $2.00 from there. As these charts show, it is in a consolidation pattern that appears to be near completion. 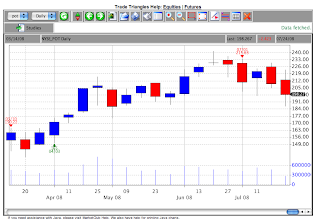 The Daily chart shows an imminient break, either up or down. The Weekly chart traces the recent action between Fibonacci levels. 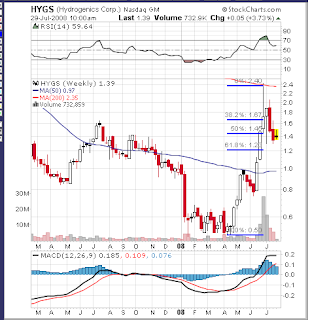 My personal entry was $0.70 on HYGS, giving me a 200% gain above $2.10. I was stopped out when the stock fell below $1.50 for a net 100% gain. I am looking to re-enter as soon as this no-mans-land consolidation is over. I love my new MacBook Pro, as I did my old Powerbook, as I do my daughters' MacBooks and iPods. With each of their birthdays coming up in the next five weeks, Steve Jobs did me a favor coming out with the iTouch, "I'll take two, please." Sounds like a Bullish case being made on the Fundamentals. Mais Non! Let's not confuse anecdotal analysis with a horrible looking chart. 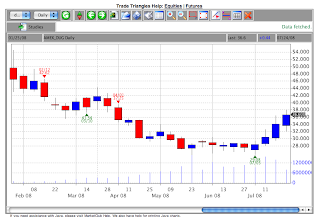 First, a Triangle Chart showing AAPL is in the early stages of a Triangle Sell. Next, let's look at another weekly chart with channels. On the chart above, AAPL looks like it wants to fall all the way back to support, which is in the area of the March lows around 120. Note also that the MACD is just now crossing over to the downside, signaling many more weeks of decline ahead. With AAPL closing at 154 today, a drop to 120 or thereabouts would be quite a move. 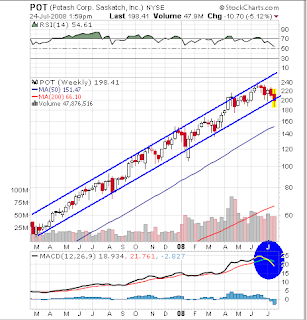 The roadsigns I respect most are all pointing to a rough summer for AAPL shareholders. When the smoke clears, AAPL should be one heck of a buy going into the fourth quarter, Christmas buying time for Mr. Jobs and his most excellent Company. We have an intriguing little mystery today from NNVC, with only good explanations. Earlier this morning NNVC issued a press release announcing that, "...Renowned Japanese ophthalmologist and corneal researcher, Kazuo Tsubota, MD, PhD, has agreed to join the Company’s Scientific Advisory Board." “Dr. Tsubota will be helping us prepare the Company’s nanoviricides drug candidates to enter the regulatory approval process in Japan. Initially, he will focus on viral eye diseases such as EKC and Herpes virus infection, among others,” said Eugene Seymour, MD, MPH, CEO of the Company. What I find so intriguing is that in a press release dated June 30, 2008, NNVC announced that this same Dr. Tsubota, "...Has agreed to perform confirmatory animal efficacy studies of the nanoviricide anti-EKC drug candidate, EKC–Cide™, against EKC (epidemic kerato-conjunctivitis) in Japan." In between these two releases there has been no news as to how that confirmatory testing in Japan was going. Yet the renowned Japanese ophthalmologist, Dr. Tsubota, has not only agreed to become a member of NNVC's Scientific Advisory Board, he is, according to the press release out today, already, "...In licensing discussions with with Japanese pharmaceutical companies regarding EkcCide.™"
What can be gleaned from all of this? Whatever Dr. Tsubota has seen in his review of EkcCide™ has impressed him and is significant enough that Dr. Tsubota wants to be part of Nanoviricides and wants to represent the Company in Japan. In due time, all of this will make better sense, as whatever pieces of this puzzle may be missing, they can only mean good things of NNVC. In the Comments from last week, someone asked for a China pick. Readers, be careful what you ask for. VisionChina Media popped 22% on Friday due chiefly to great earnings and guidance. The issue is whether that gain is the end of this move, or just the beginning? 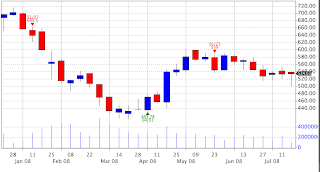 The weekly chart below says it could be either and this week's action will provide the answer. Below the charts there is an assembly of fundamental facts and opinions that strongly favor continued upside. 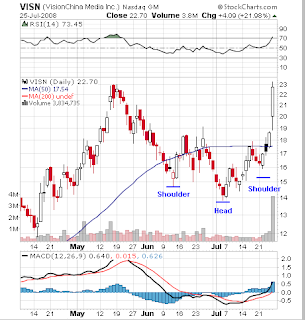 Below is a daily chart tracing out a Head & Shoulders bottom. BEIJING, July 24 /Xinhua-PRNewswire/ -- VisionChina Media Inc. (the "Company") (Nasdaq: VISN), one of China's largest out-of-home digital television advertising networks on mass transportation systems, today announced its financial results for the quarter ended June 30, 2008. -- Total revenues in the second quarter of 2008 grew 332.4% year-over-year and 48.8% quarter-over-quarter to $20.3 million, out of which advertising service revenues grew 405.4% year-over-year and 52.4% quarter-over-quarter to $20.2 million. --Net income in the second quarter of 2008 was $8.5 million, an increase of 56.7% from $5.4 million in the first quarter of 2008, and a significant increase of 3,039.7% from $0.3 million in the second quarter of 2007. -- Gross profit in the second quarter of 2008 was $11.9 million, an increase of 64.5% from $7.2 million in the first quarter of 2008 and a significant increase of 775.5% from $1.4 million in the second quarter of 2007. -- Operating profit in the second quarter of 2008 was $7.8 million, an increase of 71.1% from $4.5 million in the first quarter of 2008, and a significant increase of 3,210.8% from $0.2 million in the second quarter of 2007. “Other names I think being overlooked are companies such as VisionChina Media (NasdaqGM:VISN - News), which is a Beijing-based operator of an advertising network that has 39,000 digital TV displays, which are placed on buses and subway platforms in 16 cities in China. “VisionChina will be a beneficiary of the Olympics primarily because advertising rates are expected to surge as we go through the Olympics. That said, I don’t think that’s a reason to buy the stock. A reason to buy the stock is because it has a great franchise of virtually monopolistic exclusivity that advertises on buses throughout many cities in China. "There is typically one single license for wireless broadcast that is afforded to every city in China, so in order to secure a long-term contract, [VisionChina is] the only game in town that is permitted to do this. “With that license it is securing long-term contracts, and some of those contracts are for 10 years, but some are as long as 50 years where essentially the cost to Vision is fixed, but the advertising rates are likely to be variable. "My guess is that over the next 20 years the advertising rates within China are likely to increase, consistent with the growth in the middle class within the VisionChina market place. DUG was first highlighted here on July 2 (that special day for me, every year). It closed on that date at $27.89. A couple weeks later I reviewed DUG's progress in my July 15 blog. It closed on July 15 at $32.59. 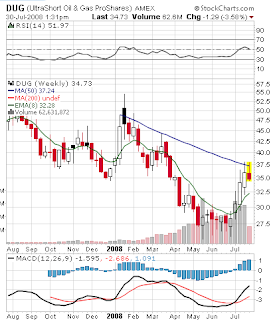 Today DUG closed at $36.69. Let's take a closer look. The chart above reveals a Triangle Buy signal on July 3rd at 29.08 and DUG is in little danger of any reversing Sell signal. 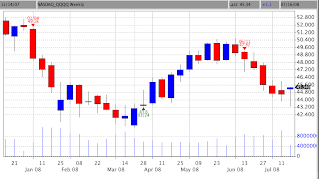 This is an updated version of the orginal Weekly candlestick chart. There are three resistance lines drawn on the chart at about 40, 45 and 50. Finally, here is a Point & Figure chart, citing a recent Ascending Triple Top Breakout which projects a target for this run of 57. This gives us targets that range from 40 to 57, so DUG is another 10% rise away before even the most conservative target is met. 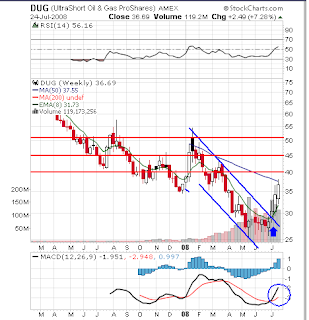 The DUG trade is a nice winner, up about 33% in the stock and well over triple digits in the October 30 call options. Trades like DUG are the reason that only half of the trades need be winners. That gain on the options in less then one month covers any losses during the month plus a nice profit from what is left over. But the month is not over and I've moved my mental stop up to a win of +100% on this trade. Not bad for a worse case scenario going forward. As someone noted yesterday, the Potash SHORT idea from July 7th is finally coming around. 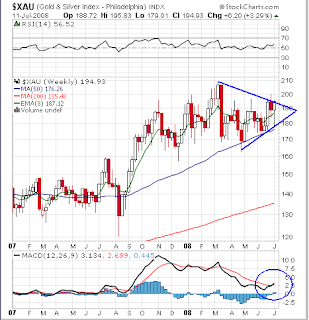 The Triangle chart above shows a Weekly Break-Down Sell Signal July 1st around 215. The previous Buy signal was on April 3rd at 165. This is a quickly updated version of the chart from the July 7th post. Note how 200 represents the bottom of the up channel; anything below 200 is bearish and a close back above 200 into the channel would not help the bearish case. 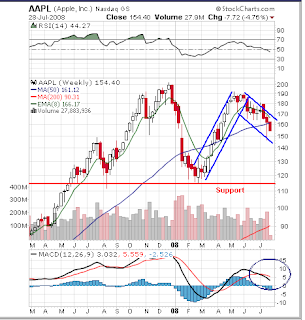 But the MACD is suggesting the Intermediate Trend is turning DOWN. Who (besides me) would buy a stock that is already up 40% today and 200% in the past two weeks? 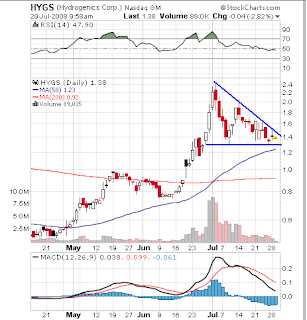 Triangle BUY June 16th @ 0.87. Targets 6 (50 day MA) and then 10-12 (resistance). The Trade: MKTY has a market cap of slightly less then $20M. They have a proprietary fuel cell battery for small electronics that lasts months. They have deals going with U.S. Department of Energy, Samsung and an unnamed major digital camera developer. They have no debt and just shy of $2/share in cash. All of the above, plus insider buying and it's valued at only $20M. While I try to figure out why, I'm in at $4.20. Around forty minutes into trading today, I had accumulated about a half dozen frantic e-mails, "......is it too late to Buy?" I take great pride in not answering such questions, not directly anyway. But it does raise an important trading issue, i.e. if you've done your research and are ready to buy a stock, what happens if you are so right that it gaps up and doesn't look back? I'll share with you two answers, one, what I did today and two, what I suggested be done by others. I. Buy at the Open. Since I already established a position on Friday at $2.80, it was easy for me to buy more on the open, this time at $3.08. If you recall, my initial heads-up on MWY was pretty scantily researched. On Saturday I did a more complete examination of MWY and posted my results. It was clearly a Buy and especially if it popped above $3.00. By today's Open, that was a clear path MWY was taking so without hesitation, I finished establishing my position. II. Buy on Dips. By the time the questions rolled in as to what to do about MWY running, it was way too late to tell people to buy at the open. Since even the strongest of runs include dips, that was the next best strategy, buy on the dips. As the chart below shows, there were two clear dips during today's 35% run. The first occured around 11:00 AM EDT and the second around 1:00pm. All of this is much easier said then done, I know. 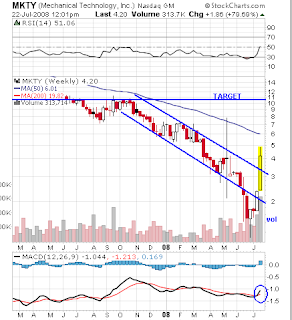 But don't forget the targets for MWY are pretty high relative to stock price, 100% above Friday's close, or better. So buying the stock after it has risen 10-20% still retains most of the expected gain, even if the stock comes back on you. Looking back from $6.50, does it really matter all that much if you paid $3.00 or $3.30 for the stock? III. New Targets. 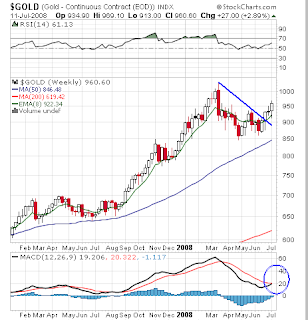 Here is a new chart, a monthly chart (with Triangle signals) on which I have placed a couple resistance lines, one at about $8.00 and the second at about $10.00. 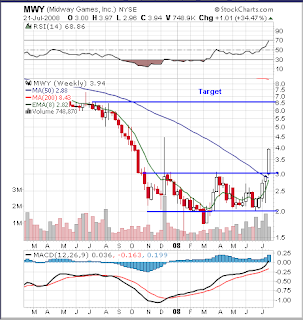 If MWY closes this week above $3.00, this range will become my new target. WEST HAVEN, Conn., Jul 21, 2008 (BUSINESS WIRE) -- NanoViricides, Inc. (OTC BB: NNVC.OB) a development stage company that is creating special purpose nanomaterials for the treatment of viral infections, today announced that the company has been added to the Ludlow Biotech Index. Look at what kind of companies are included in the Ludlow Biotech Index. Is this "Peer Review" enough for the skeptics? NNVC remains a core holding. From time to time I will be dipping into my emails to publicly respond on topics that may be of general interest or utility. All names (except mine) are removed, so as not to discourage future emails. Do you do much trading in the pre-market or after-market? Not so much these days, although I used to trade both pre and after markets. it's just too much effort and very tricky with lower liquidity. I had about an equal number of wins and losses, so instead of trying to perfect it, I just stayed with regular hours trading. I am also a retired lawyer and have been long NNVC, SYBD, CTGI, et.al. for some time. Most of my trades are long-term. Your reference to day-trading interests me since most short term traders do not seem to do well. If you have a stock blog to which I could subscribe please let me know. My only blog is the free AllAllan blog which you have already found. No subscription necessary. As for day-trading, I have my own unique trading system that I have been trading since 2003 with consistent success. It is by its very nature very time sensitive, so it does not lend itself to a subscription service or a blog. I read Paradigm by R. Taylor some many moons ago and also, in searching for feedback, bumped into your blog report on him. Initially it seemed that you were also impressed with his timing. Have you had cause to revise your opinions on him and his methodology? I stand by my earlier statements about Paradigm and Taylor, but I really don't trade the cycles much. My own trading methodology doesn't rely on market direction at all, so I just don't use market timing anymore. I notice some people have had great success with the CANSLIM method.What is your opinion of it? Pretty good, general guide, not the holy grail but a great way to structure an approach to stock selection. How does one go about investing in hedge funds? Can anyone invest? Is it like a mutual fund? Because of the nature of private funds, it is generally required that investors be "Accredited Investors" as defined by Rule 501 of Section D of the Securities Act of 1933. In short, an individual would be considered, "Accredited" if they have a net worth that exceeds $1 million dollars at the time of purchase, or, has individual net income of $200,000 in each of the two most recent years. I recently stumbled onto your site by mistake a week or so ago while trying to find the name of a stock that Mr Navellier was touting in an effort to sell one of his services. I must say, I am awed by your insight and ability to communicate in order for folks to understand this stuff. I love it. I’m a real novice at this and am trying to understand the technical aspect of it. I guess that’s why I’m fascinated by your info as it not only provides information but also some explanation and analysis. If I understand your writings, you are primary a trader and do very little “holding”. Like I said, I just started reading your blog (what a word) and have tried to read some of your historical writings. My primary purpose for writing this is to say thank you for doing what you do. My hope is to build a foundation of knowledge so when I retire I can devote more quality time to this. My work is quite demanding but with 4 years to go, I have to stick it out. Hopefully, along the way, I can make a little additional money to help out the cause. Sorry for the rambling message. I just felt compelled to write and say thanks!!! I was also wondering if you have any favorite websites or resources you use to do analysis on companies or specific industries and what about charting, what software do you use? I use two websites exclusively for charting. My nightly scans are done at Market Club as well as my initial charts. 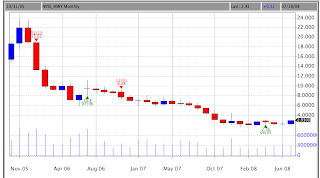 When I find a stock I like at Market Club, I will take a look at the same stock at Stockcharts.com. I know what I am looking for and if I see it at both sites, I know it's there. As for fundamental analysis and resources, I am all over the place. First stop is always at Yahoo Finance for basic financial analysis. I like to also go to the company's own website where some of the very best fundamental data can be found. Just reading a years worth of press releases often provides valuable insight into the company. Finally, I have some specialized sources, some free, some subscription based, that cover unique aspects of trading. Most of these sources I have not disclosed to the public. I have developed some proprietary trading routines based on these unique sites and I am not ready to just give them away. As far a software goes, I have tried quite a few over the years, but none better then the charts I make at Market Club and StockCharts.com. 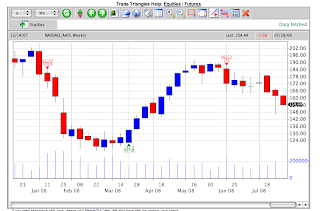 Other then those two, probably the best stand alone trading software I ever used is Advanced Get. It pretty much guided me through the final five years of the 90's. Now it has become part of E-Signal and tied into their data feed. In a sense, by "improving" it through years of updates, it has become a fairly complicated work and unfortunately, more subjective with each new update. Nonetheless, the patterns I learned from Advanced Get are still with me and many of my charting skills are based in concepts I learned using A-Get. But instead of getting more complicated and more subjective, my approach to TA has gotten more basic and much more objective. I've certainly posted enough charts here in the past few months to pass a lot of what I do along to readers. It's not exactly brain surgery. I just noticed on this list of top 100 stock message blogs, you are now at #90. Very Impressive!!!! Looks like they missed, by about 89 slots. I am Lt General James Morgan (Rtd), National Security Adviser to President Alhaji Umaru Musa Yar`Adual Federal. I am delighted to inform you that the contract panel, which just concluded it's seating in Abuja just released your name amongst contractors to benefit from the Diplomatic Immunity Payment. This Panel was primarily delegated to investigate manipulated contract claims, contracts and over-invoiced payment as the effect has eaten deep into the economy of our dear country. In this regards we are going to send your contract part payment of 10Million USD. To you via our accredited shipping company and I have secured every needed documents to cover the money. Note: The money is coming on two security proof boxes. The boxes are sealed with synthetic nylon seal and padded with machine. Please you don't have to worry for anything, as the transaction is 100% risk free. Please kindly get back to me today also with the requested informations so that we can proceed on this matter as soon as possible. 1)Your full name. 2)Phone, fax and mobile #. 3)company name, position and address. 4)profession, age and marital status. 5)Copy of int'l passport,drivers linsense,or any valid ID card. And a big B-B-B-Booyah right back at you, Jim. I can tell your writing style anywhere. Following up on the MWY idea, first let's look at the longer term chart below (click it for bigger image). MWY was in a long downtrend, falling from above 15 to below 2 in a little over three years. The Triangles picked up some good long-term trades, Selling at 15, Buying at 11, Selling again at around 8 and finally Buying at 2.76 on April 1st. So while the stock fell 80% in that time frame, trading just the Triangles made 40%. Based on purely mechanical criteria, MWY is on a Buy. Notice how the Volume bar from the most recent week's action is the highest volume since last December. Friday represents a 3-month breakout, a close over 3.00 represents a six-month breakout. CHICAGO - April 18 , 2008 – Midway Games Inc. (NYSE: MWY), a leading interactive entertainment software publisher and developer, today announced Mortal Kombat® vs. DC Universe, licensed by Warner Bros. Interactive Entertainment. When a cataclysmic force merges conquerors from two universes, conflict is inevitable. Kombat forces friends to fight, worlds to collide, and unlikely alliances to be forged. In order to save all they know, the heroes and villains of Mortal Kombat must wage war against the combined might of the DC Universe (DCU). How can either side prevail when rage blinds them to the dark threat poised to destroy them all? For the first time ever Scorpion, Sub Zero and the warriors from Midway's billion-dollar fighting franchise face off against Batman, Superman and other iconic and powerful DC Super Heroes, featuring signature attacks for both sides and a unique and intertwining storyline, written as a collaboration between the Mortal Kombat creative team and top comic scribes Jimmy Palmiotti (Painkiller Jane, Marvel Nights, Jonah Hex, 21 Down) and Justin Gray (Batman: Legends of the Dark Knight, JLA Classified, Punisher Red X-Mas, The Resistance) MK vs. DCU is slated to ship for the PLAYSTATION®3 computer entertainment system and Xbox 360® video game and entertainment system from Microsoft in Fall 2008. 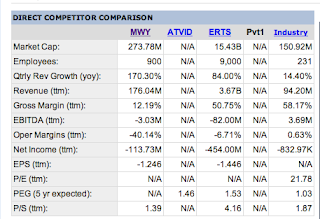 Also noteworthy, look at how Midway stacks up against Electronic Arts in terms of market cap versus annual revenues. ERTS sells at about 5 times annual revenue, while MWY sells at less then 2 times revenue. 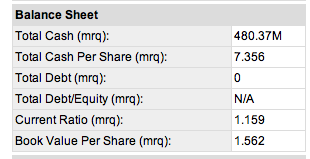 If MWY traded at only 3 times revenue, it would be trading at about $6.00 per share. At 5 times revenue, about $9.00 per share. Sumner Redstone's daughter, Sheri Redstone, is the Chairman of the Board of Midway Games. Whoever is calling the shots, shareholders should be in good hands, i.e. going forward, nothing bad will be allowed to happen. All of this adds up to a pretty good bet here. 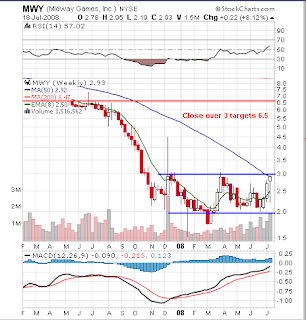 MWY is a good trade at current levels, but a really good, almost great trade at any close above 3.00, especially on good volume. Of course there is no guarantee this will work and I allow for 50% of all my trades not to work. It's the 50% that do work that make this all worthwhile. MWY has all the characteristics I am looking for to end up in that winning 50% group. I've been running my MC scans all day and Midway Games keeps coming up on all the best short-term breakout scans. 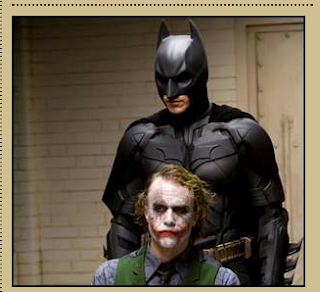 Checking Internet sources, it may have to do with Batman movie and a new video game coming out from Midway. Don't have time for a complete analysis, so consider this just an intraday heads up on a potential breakout stock. On July 1, 2008 this blog published The Case for Gold. There was no written text in that blog, as the case for gold was made on the basis of just two charts, the CRB Index and the Continuous Gold Contract (EOD) Index. This was an example of basing a trade on only technical analysis, which I do a lot of these days. Ideally, Confirmatory Analysis requires that good technicals be confirmed with good fundamentals. The fundamentals can be in the form of traditional company-specific financial line items, i.e. 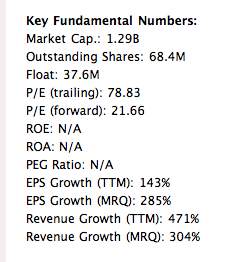 earnings growth, revenue growth, book value, dividends, price to sales ratios, etc. But the idea of fundamentals can also be stretched to include a good stock-specific story, i.e. 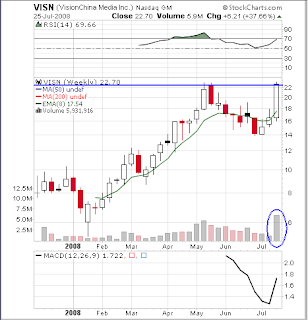 NNVC, or a good sector-specific story, i.e. 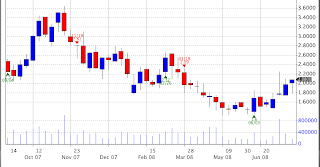 Alternative Energy, or a host of other considerations that bode well for the stock breaking out with good technicals. What is convenient about Confirmatory Analysis is that you don't have to accept the underlying fundamentals as the gospel, whether it be financial considerations or a good opportunistic story. The price chart of the security has already spoken, although fundamentals just may be spot on anyway. So why deal with fundamentals at all? My most reliable chart patterns appear on many more stocks then I can buy. 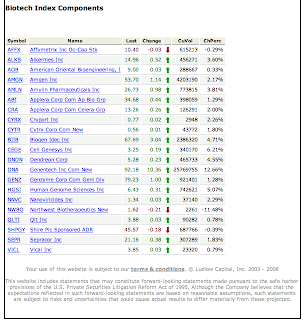 So I like to look for stocks that also have good fundamental exposure as well. That filters my stocks and feeds my ego as it is much easier to talk a good story about a stock then to explain to someone at a cocktail party what a head and shoulders bottom or a channel break-out means. Plus, there is always a chance that the fundamental guys like Louis Navellier and William O'Neil may be right. *The long-feared, U.S. credit crisis is now here, led by the collapse of mortgage lender giants Fannie Mae and Freddie Mac, and the bankruptcy of IndyMac Bank of California. *Had Fannie and Freddie been allowed to go under Monday, it would have wiped out the home mortgage market in the U.S., and resulted in plummeting real estate prices, foreigners dumping the dollar, and a major economic depression. *To avoid this happening, the U.S. Treasury Department assumed their $5 trillion debt. That means the U.S. national debt instantly increased in one-day by 50 percent, from over $9.6 trillion to nearly $15 trillion – about $750,000 for every working American. *The only way the enormous debt of the federal government and banks is going to managed is by massive monetary inflation. Even before this crisis, the real rate of U.S. inflation was closer to 15 percent a year rather than the official 3 percent, according to Shadowstats.com. I now expect inflation to go over 20 percent in the next year or two, and perhaps much higher. *This huge rate of inflation is going to be financially devastating to our economy and to the average person’s finances. For starters, 20 percent inflation means that value of savings is 90% wiped out in about 10 years. It also means massive business failures, particularly of any business which relies on credit to finance their operations. It means soaring commodity and energy prices, which you can expect to rise at least 20 percent in the next year. Finally it means plummeting living standards for most families, which have no way of increasing their after-tax income by anything like 20 percent. *One immediate recommendation: Buy gold, in every form you can get it – coins, stocks, and options. Even before this crisis, gold prices were up 50 percent in the past year. I expect the gains in the next year will be much higher. 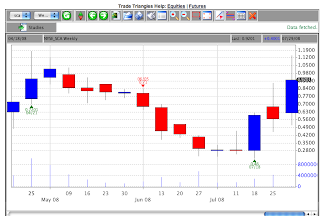 It's no great surprise that I embrace charts as my primary trading tool. 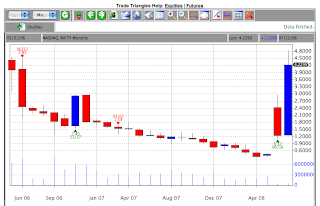 Many of the trades that I publish here are displayed on charts created at StockCharts.com. But that is usually not where they are discovered. For my nightly stock scans, which is the beginning of my systematic analysis and creation of trade ideas, I use Market Club. What I like about their scan is that it is tuned for breakouts, utilizing various time horizons, i.e. daily, weekly, monthly or quarterly as well as their own proprietary trade identification methodology. Unlike a lot of market scans, with MC I get a list of stocks that have already been filtered based on my own criteria, so instead of unmanageable lists of hundreds of stocks, I end up with about a dozen choices already prequalified per my very selective taste in trades. I use my eyeballs for the next step, picking out the best charts, or at least the most opportunistic looking charts, for further refinement. 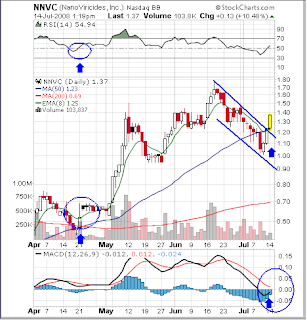 Often I will then utilize StockCharts.com to put on my channels and assorted other indicators which add perspective and an easily printable and electronically transferable image, many of which make their way to this site. Simple as it sounds, that is all of my technical analysis. I can and have made it more complicated, way more complicated, but always less effective then these simple breakout charts. 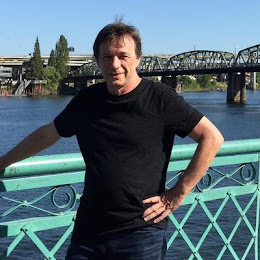 Coming Soon: Trading Tools - Part II "Fundamental Analysis avec Alain"
If even this is too much work, Market Club does have their own embedded mechanical breakout trading system, something to do with Triangles. 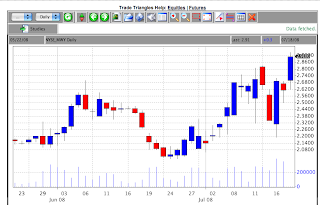 Without their permission, here are some screen shots from tonight's charts, on a couple well known stocks. Sell Signal on June 11th at 47.82. I've got 10 short-term positions on right now, otherwise known as "swing trades." Five of the ten are winners, five are losers. The average net profit for all ten positions is +28%. In other words, adding up all the wins and losses, my average trade is ahead by 28%. 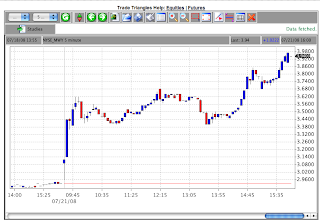 These trades generally last a few days to a few weeks. Usually, as trades come off, new ones get put on. I can have as many as 20-25 trades on at any one time, or as few as zero. Batting .500 only works when the amount won per trade is higher the amount loss per trade. So when going into a trade, I always look for risk:reward parameters. 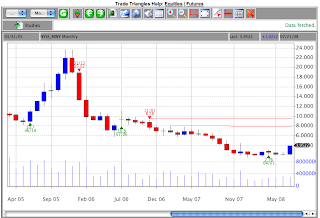 My potential gain must be 3X my potential loss (based on charting principles) for me to take the trade. This rule applies whether I am trading stocks or options. That, in a nutshell is how this works for me. In your own trading, if you were asked how it works for you, do you have an answer? My guess is that if you are successful in your trading, you do, and if you are not successful in your trading, you don't. If the latter applies, you are only a few basic ground rules, etched in your daily discipline, away from turning things around. Here's another one that is up, this time about 15%. On July 2nd, I posted this Blog on DUG. 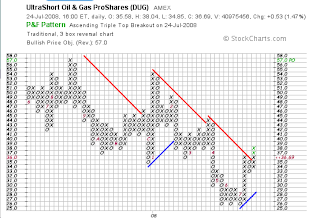 As you can see on the chart below, DUG's move up appears to be just beginning. I bought the October 30 calls, which are up about 60% since entry, but I expect these calls to be triple digit winners before the trade is over. SRS was highlighted in my July 6th Blog. At the time, it was trading at about 110. Today, nine days later, it is up 10%, trading around 121. My October 120 calls are up about 60%. All this while the market has been in a downward spiral. But that's what SRS was suggesting when it was breaking out in late June and early July. Here is a current chart as of Tuesday morning, July 15th. No annotation is necessary. It doesn't take a rocket scientist to guess where SRS is headed. Nonetheless, if it starts to come back in, I will protect my gains. There will always be another idea for another day. The fundamentals are contained in my previous Blog. Here are the technicals. Looks like a move is beginning to at least test prior highs around $1.80. WEST HAVEN, Conn.--(BUSINESS WIRE)--NanoViricides, Inc. (OTC BB: NNVC.OB) (the “Company”) reported today that excellent efficacy of its EKC-Cide™ nanoviricide drug candidate was revealed upon statistical analyses of clinical scores from the first animal study. The EKC-Cide drug candidate clearly demonstrated prevention of conjunctival injection (redness, dilation and prominence of the conjunctival blood vessels) and blepharitis (crusting, discharge and inflammation of the eyelid margins) using mathematical clinical scores calculations. These data confirmed the excellent clinical response observed earlier in eye photographs. In contrast, the control group which received an inactive drop preparation (“negative control”) displayed statistically significant higher clinical scores consistent with the expected strong progression of infection. A rapid clinical response to the EKC-Cide treatment was also revealed by these data, confirming earlier photograph observations. Substantial differences in clinical scores, demonstrating clear prevention of serious infection and improvement upon treatment, were observed within three days after treatment. Moreover, while both scored parameters (conjunctivitis and blepharitis) were still significantly elevated even at day 10 in the “negative control” group; in the EKC-Cide treated group both parameters had returned to normal already at day 7, indicating full recovery. These clinical scores were based on daily observations and recording of the animals by trained observers. Further biological analyses are in progress. The Company has previously posted photos on its website which demonstrated the rapid response to treatment using the Company’s nanoviricide drug candidate against Epidemic Kerato-Conjunctivitis (EKC) (http://www.nanoviricides.com/action_small_EKC_2008-06-09.html). “EKC-Cide may have efficacy against other viral conjunctivitis as well,” said Anil R. Diwan, Ph.D., President of the Company, “It uses a broad-spectrum ligand for finding the virus. Binding sites for this ligand may be present on a large number of viruses.” The Company plans to evaluate this broad-spectrum eye-drop formulation against other viruses that cause eye diseases such as herpes simplex virus (HSV). The Company has previously reported that it is in talks with certain pharmaceutical companies regarding potential licensing of a nanoviricide against adenoviral EKC. The two clinical scores employed were for “conjunctival injection” i.e. redness and dilation or prominence of conjunctival blood vessels, and for “blepharitis” i.e. crusting, discharge and inflammation of eyelid margins. Both are classic signs of pathological infection. While the Company currently has no approved product for the treatment of EKC and viral conjunctivitis, the treatment and prophylaxis market for these classes of eye disease is expected to be of the order of several billion dollars annually. EKC is a highly contagious and very severe inflammation of the eyes that results in disabling red eyes, discharge and inflammation of the eyelids with clinical symptoms lasting several weeks. Bacterial conjunctivitis may be treated with antibiotics; however, there is no treatment currently available for viral EKC. Further, viral EKC, in some cases, may result in the formation of hazy spots in the cornea called “sub-epithelial infiltrates” which cause blurriness of vision, a condition that may last up to two years. On July 1st I made A Case for Gold. Let's take a fresh look at the charts and see if anything has changed. 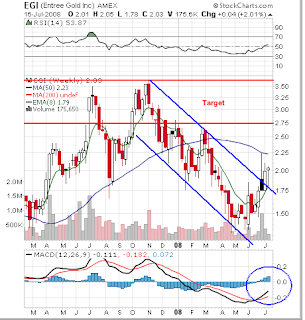 In two weeks Gold has confirmed a break-out and the MACD is now just about crossing over for a Buy signal. 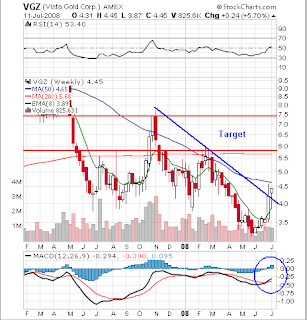 In the chart below, Vista Gold is still a favorite, with everything lining up for a about a double from current levels. Below is a chart of the XAU, a/k/a Philadelphia Gold & Silver Index. I added some trend lines on the weekly depicting what appears to be a wedge, one of the most powerful and reliable chart patterns in our arsenal. 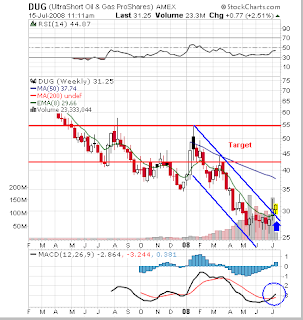 If XAU breaks up over the wedge, Gold is running big time. In the overnight Globex market, the S&P's are up about 15 points, indicating a very strong opening on Monday if it holds. Gold is up about $1.00. 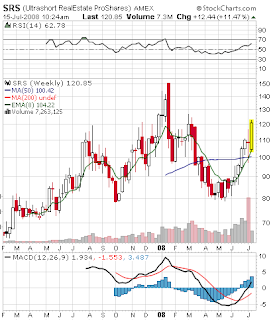 I'll be watching Gold and a half dozen Gold Stocks this week, that is where opportunity is presenting itself for now.